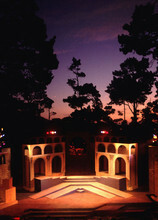 Starlight, moonlight, and a peek of the Pacific, framed by towering Monterey pines and two huge open fireplaces, provide a majestic backdrop for this open-air theater. Come early and enjoy your own picnic supper before the performance. Bring a blanket! No reserved seating. The oldest outdoor theater west of the Rockies, the Forest Theater was founded in 1910. The first production there was Constance Skinner's biblical drams "David", and was attended by over 1000 people. The production was directed by the well-known professional coach, Garnet Holme, from the University of California, and featured Herbert Heron in the title role.